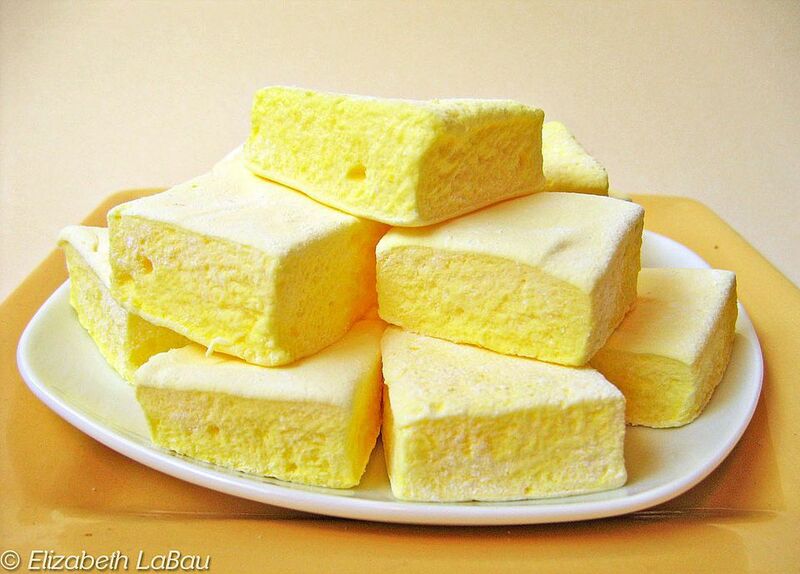 These homemade lemon marshmallows are NOTHING like what you buy in stores. They're light and fluffy, with a wonderfully pillowy texture that's a far cry from the hard, stale marshmallows on grocery shelves. The fabulous texture isn't the only reason to make your own marshmallows, however! Making your own means you can customize the flavors and make whatever marshmallows you want. This recipe uses lemon juice and lemon zest to make sweet-tart lemon marshmallows with a fantastic citrus kick. They taste like real lemons, which is more than I can say for most lemon candies! If you want to increase the sour flavor further, consider adding 1/4 tsp of citric acid to the marshmallows after they're mixed. Combine the cornstarch and powdered sugar in a small bowl. Prepare a 9x13 pan by lining it with foil and spraying it with nonstick cooking spray, and sprinkle a generous dusting of the sugar/starch mixture over the entire pan. Set the pan aside while you prepare the marshmallow, and save the sugar/starch mixture for later use. Combine the granulated sugar, corn syrup, lemon juice, and 1/2 cup water in a large pot over medium heat. Stir until the sugar is completely dissolved, then stop stirring and allow the mixture to come to a boil. Continue boiling until mixture reaches 260 degrees (hard-ball stage). This process will take awhile, so move on to the next two steps while the sugar syrup cooks, but be sure to check the sugar syrup frequently so that it does not go above 260 degrees. In another pan, soften the gelatin in 3/4 cup water for 5 minutes, until completely absorbed. Set the pan over low heat and stir constantly until the mixture is liquid. While the sugar syrup is boiling and the gelatin is softening, place the room temperature egg whites in the clean bowl of a large stand mixer fitted with the whisk attachment. Once the sugar syrup nears 245 degrees, begin to beat the egg whites. Beat them until they hold firm peaks, but do not overbeat or they will be crumbly. If the egg whites are ready before the sugar syrup reaches the correct temperature, stop the mixer until the sugar syrup is ready. Whisk the gelatin mixture into the sugar syrup. Turn the mixer to low, and gradually add the sugar syrup in a thin stream. If your saucepan has a spout you can pour it from the saucepan, but if it does not I recommend pouring the syrup into a large measuring cup or pitcher so that it is easier to pour. The sugar syrup is very hot and it can cause painful burns if it accidentally spills or splatters. After the sugar syrup is incorporated, add the yellow food coloring and lemon zest, and gradually increase the speed until the mixer is running on high. Beat until the marshmallow mixture is shiny, thick, holds its shape, and is completely opaque, about 10 minutes. Pour the marshmallow mixture into the prepared pan and smooth the top flat with an offset spatula. Let the marshmallow set overnight, uncovered. Once the marshmallow has set, dust your workstation with a generous layer of the sugar/starch mixture you used to prepare the pan. Lift the marshmallow from the pan using the foil as handles, and flip it facedown on the prepared surface. Peel the foil off the top of the marshmallow, and dust the top of the candy with more sugar/starch. Spray a large, sharp chef's knife with nonstick cooking spray. Cut the marshmallow block into small 1" squares, or whatever size marshmallows you desire. You can also use sharp metal cookie cutters to cut different shapes out of the marshmallow. Dredge the cut edges of the marshmallows in the sugar/starch mixture so that they are not sticky. Your marshmallows are now ready to eat! They are best soon after they are made, but if your environment is not too humid, you can store them up to a week in an airtight container at room temperature. You may need to dredge the sides in sugar/starch again if they get too sticky.